It has been more than 42 days without a new Ebola case in Sierra Leone, which means it is time to smile and shout and dance in the streets with joy. 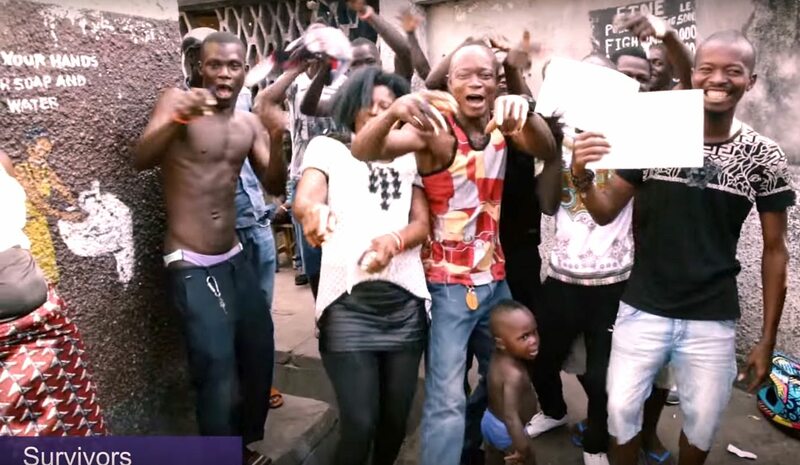 A new rap video shows Sierra Leoneans doing exactly that. If this doesn’t make you feel good, nothing will. By SIMON ALLISON. Sierra Leonean rapper, Block Jones, is a master of understatement. “Ebola passed by the nation, it caused some frustration,” he sings in a new music video. It was more than just some frustration. The Ebola epidemic ravaged Sierra Leone, infecting 8,704 people and killing 3,589 since the first infection in May 2014. The virus wiped out entire families, devastated communities, and forced people to adapt their traditions, and change their way of life. But Ebola has been defeated. On Saturday, it had been 42 days since any new cases of Ebola were discovered in the country. This, according to the World Health Organisation, means that it is safe to declare the epidemic over. “Thank God it’s gone, a new day has come,” raps Block, in his new video featuring the Freetown Uncut collective. The video is called Bye Bye Ebola, and it might just be the most heart-warming three minutes on the internet. Don’t believe me? Watch it yourself. You will see staff in the Ebola Treatment Centres – fully garbed in their protective rubber suits – dancing in their now-empty wards. You will see policemen twerk at their checkpoints, which were vital to preventing the spread of the disease. You will see burial teams break it down in front of their makeshift hearses. You will see soccer players doing backflips, traders twirling their merchandise, and fishermen nearly over-balancing their wooden boats as they all do Azonto, the West African dance craze. Even President Bai Koroma gets involved, holding up the V for Victory sign in his office. It is like the whole nation is dancing in the streets. This is catharsis, Sierra Leone-style. The video mirrored the jubilant emotions at the official ceremony on Saturday to declare the country Ebola-free in the capital, Freetown. “The swirl of emotions was evident on the streets of Freetown, where people started gathering at midnight in anticipation of the announcement, dancing in celebration. But there was also quiet reflection. Names of the dead were read aloud, and people gathered a giant cotton tree for a vigil for health workers who died,” reported the New York Times. Of course, just because there are no new cases does not mean that Sierra Leone is finished with Ebola. The long-term consequences of the epidemic are just beginning to manifest themselves in the country’s poor economic performance, and the health system will take years to recover. “For us, Ebola is not over. We need your help to treat the many, many health problems we still suffer from. And remember those who died at the hands of Ebola, and especially the children who have been affected by this outbreak,” said Yusuf Kamara, a healthcare worker and Ebola survivor who lost 16 members of his family, in a speech at the ceremony. Also concerning is that neighbouring Guinea, the source of this Ebola outbreak, is still battling with new infections. “As long as Ebola remains on the doorstep of Sierra Leone, the risk of new cases in the country will exist. Vigilance and the capacity to respond quickly to eventual cases must be maintained not only in Sierra Leone, but across the West African Region. Further, caring for the country’s 4, 051 Ebola survivors remains a big challenge. Many survivors have reported a number of medical ailments, including vision problems, fatigue, joint pain, symptoms of depression and generalised body,” said Doctors Without Borders in a statement.